The predominantly agricultural region of Targovishte is well known for its vineyards, yielding some of the best Muscat and Chardonnay in the world. Its fertile plains among picturesque hills are the perfect background for sampling wine, particularly in the villages of Kralevo and Naderevo. 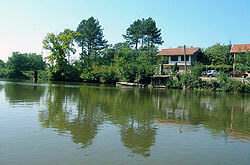 Targovishte has a good climate and a great deal of natural beauty. The dense forests covering it are magnificent. Although most rivers that cross the region dry out during the summer, the serene Borovo Oko Lake is open for year-round recreational activities. Most tourists come to Targovishte City to visit its beautifully preserved old quarter, or Varosha. Old homes still stand here, as do the old, gold-spired Assumption Church and the town’s Historical Museum, charming visitors with their traditional mid-19th century National Revival architecture. There are also healing mineral springs at the natural forest park (known simply as The Park) in the southern part of town. Other natural landmarks in the lilac- and tulip-dotted Vrana River gorge include a horse-shaped figure called the Konyat, situated along the eastern slope of Lale Balkan. There’s also the Vodopada Waterfall, the Marinina Dupka cave, and the historic Krumovo Kale castle. Situated on the fertile Danube plain and surrounded by lakes and forests, Targovishte City is an agricultural and wine region known for its natural beauty. There is aso a sanatorium and spa centre built for visitors who want to try the calming and healing properties of the mineral waters of Boaza. The scenic Lake Borovo Oko is ideal for leisure and recreation, and there are two parks nearby: the Hunting Park and the Yukya Forest Park. Targovishte has a Varosha, or old quarter, with over 30 architecturally interesting buildings built during the National Revival period.